The most beautiful of our tropical blueberries, Cavendishia tarapotana var. gilgiana*, surprised me this month with a burst of flowers. The last time our plant flowered was in July of 2011 so I had begun to think of it as a long day plant--i.e., a species requiring short nights in order to set buds. Maybe not. Regardless, the species is an absolute stunner and well worth a look if you are visiting the Tropical High Elevation House in the Fuqua Orchid Center. Blueberries and Rhododendrons belong to the same family, the Ericaceae. 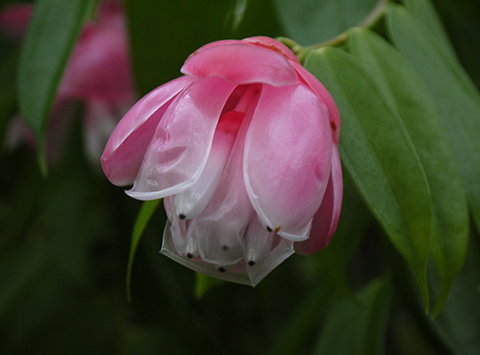 Like many of the tropical blueberries, Cavendishia tarapotana var. gilgiana is an epiphytic shrub, and a gigantic one--each of our two plants measures about 6' from tip to tip. 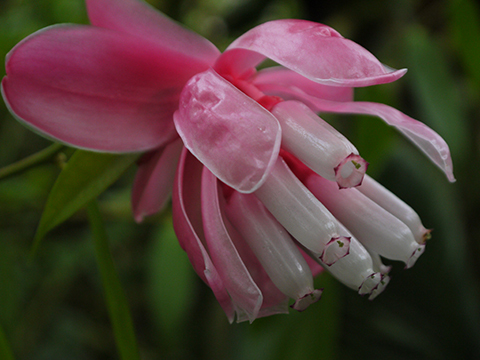 It is native to Colombia and Ecuador. Tropical blueberries produce fruits that are rich in antioxidants, but not so rich in flavor. Not bad, just bland. Some enterprising hybridizer may take them in hand one day, but I think they are wonderful just as they are. Tropical blueberries are easily propagated by cuttings of the current year's growth 5-6" long, using either Rootone or a 10% solution of Dip 'n Grow. Our cuttings are rooted under fog in a cutting mix of 3 parts perlite to one part peatmoss. They root in about eight weeks. We grow our plants in an mix that we use for our tropical epiphytes. It consists of milled sphagnum, fine fir bark, charcoal and tree fern fiber. A mix of equal parts fine fir bark, charcoal and peatmoss works equally well. Such an interesting plant in the ericaceae family. 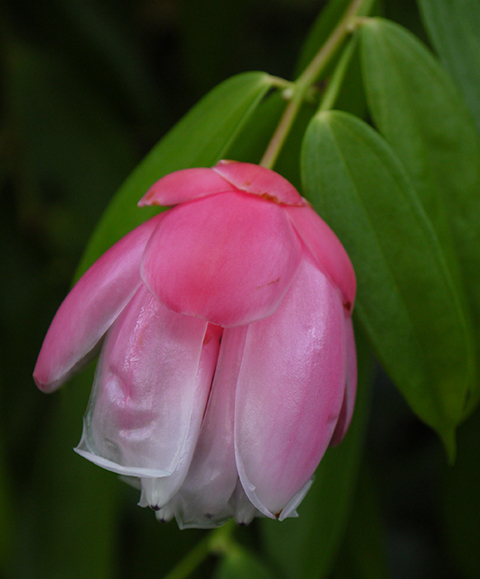 I'd love to grow one although they're not available anywhere unless you move to Ecuador.